In celebration of Abercrombie & Kent's 50th anniversary, Geoffrey Kent, Founder, Chairman and CEO will be joining A&K's Classic Antarctica expedition this November (2012) -- and inviting guests to sail with him on board 'Le Boreal' through the Southern Ocean. We predict a rush to book on the trip because when it comes to the great outdoors few know the wide open spaces (on land or sea) better that Geoffrey Kent. Adventure is in his blood, heavens the man was even born while his parents were on safari. His parents Valerie and Colonel John Kent, founded Abercrombie & Kent in 1962. 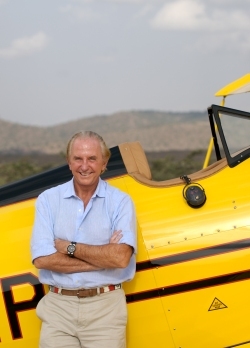 Among his many accomplishments Kent was the first person to travel from kenya to to Cape Town on a motorbike, he has also been a champion polo player and still travels the world scouting new locations. Under his inspirational guidance A&K (one of TLTB's favourite companies) has grown into a global concern that runs 62 full-time offices worldwide, staffed by more than 2,300 people. It operates its own safari camps and Nile cruise ships, and maintains a fleet of customized safari vehicles. The company's more recent innovations include Extreme Adventures and Abercrombie & Kent Residence Club, the largest equity-based destination club in the industry. What inspired you to create Abercrombie & Kent? Though British by birth, my parents were drawn to the freedom and beauty of life in Africa, qualities that made a powerful impression on me. We lived on a farm in the highlands of Kenya. Growing up there, my whole life was a safari. At the age of 16 I drove my motorcycle from Narobi, to Capetown - the first person to ever do so. After high school, I joined the Royal Military Academy Sandhurst in England, and became a professional British Army officer. From there I joined the 5th Royal Inniskilling Dragoon Guards, one of Britain's finest cavalry regiments. When Kenya won independence and it became clear we would lose the farm, we founded Abercrombie & Kent and introduced the first photo safaris. Until then all safaris were hunting safaris. But working with an engineer I met in the Army, I built the first mobile tent safari through the introduction of refrigeration which enabled us to serve fresh food and ice throughout a 30-day safari. So with the slogan "Hunt with a camera not a gun" and little more than an old Bedford truck and my mother's sterling silver ice bucket, I launched a product that was to change people's expectations of luxury travel. What is the single most defining thing about A& K journeys? Our unique organisational structure. By establishing Destination Management Companies in developing countries, we invest in on-site offices, staff and equipment and provide job opportunities and training to over 2,300 citizens on six continents. Our deep roots and long-established relationships insure "by invitation only" access to inspiring experiences in a personalised, low profile and intelligent style. A&K seems to meld luxury with adventure with equal success. How do you achieve that balance? The secret is adventure by day and comfort at night. We travel to the most spectacular places with the finest wilderness guides and A&K's trademark blend of privileged access, air-tight organisation and outstanding service. You are known as a bit of an adrenaline junkie, what excites you travel-wise? I love places where you can be active. If you've only seen animals from a vehicle, walking with big game is a thrilling experience. I also love adventure cruises. In a place like the Galapagos Islands, you swim and snorkel with sea lions and hike in the highlands to look for giant tortoises. You were born 'on safari' , brought up in Kenya and pioneered the whole idea of luxury safaris - what are your favourite places in Africa? I prefer our tented camps where you can hear the sounds of the night. 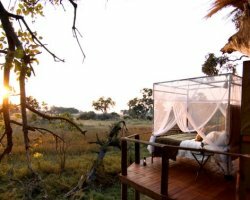 There is nothing like sleeping out under the stars in Botswana's Okavango Delta or in a treehouse on the banks of the Zambezi River. 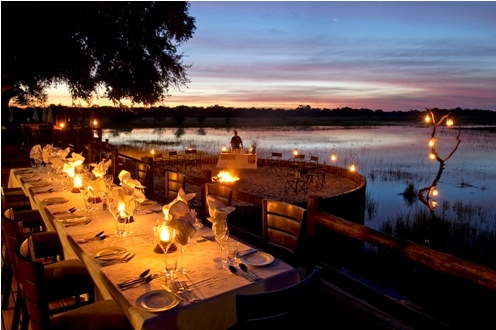 What is the difference between a tented camp site and a 'luxury' tented camp site? Our tents are enormous, 28 feet long by 14 feet wide and 9 feet high, made from heavy duty canvas with a sewn-in floor and floor to ceiling arched windows made from netting. Each Tent (we call them 'pavillions') is furnished with two full-size single beds with bedside tables; a dressing table with mirror and wash basin; and private en suite shower and toilet (A&K is one of very few travel companies to offer flush toilets in mobile tented camps in East Africa). Camp cuisine is excellent and served at linen-draped tables set with crystal, china and candles. The safari bar is fully stocked with personal selections. There is even an efficient in-camp laundry service. Many of our camps now have a safari spa - there's nothing like a massage after a long day in the bush. Conservation is very close to your heart what can the average traveller do to help the cause? We are very proud of what we A&K Philanthropy has achieved through our offices around the world where we have identified proven grassroots organisations, spearheaded by dedicated local experts in conservation. We encourage clients to visit these projects and become actively involved. For example, in Kenya we have established Conservation Clubs in schools that have helped to plant more than 250,000 trees. Multi-generational family travel is increasing exponentially. Most families find that their daily lives are so hectic with work and school that holidays are really the only time where they can reconnect as a family. The Abercrombie & Kent Residence Club provides a hassle-free alternative to owning a second home with a choice of magnificent private residences in popular resort destinations that can accommodate the entire extended family. And you can exchange nights for A&K travel anywhere in the world. What is your own personal litmus test for whether an experience is worthy of the 'luxury' tag? I'm looking for an authentic experience that is true to a place and its traditions, incorporates elements of the past and reflects the local culture. And of course has the ability to deliver delicious cuisine and fine wines. The splendour of the Taj Palace Hotels in India, such as the magical Lake Palace in Udaipur, always reminds me of my polo-playing days and Oberoi's stunning villa-style hotels in Jaipur and Agra are experiences unlike anything in the Western world. In cities I prefer hotels with contemporary design, great dining, an outstanding gym and good location. One of my favourites is the Bulgari in Milan and Armani Dubai. Rio de Janeiro. It is endlessly fascinating , fast moving and always exciting. My most memorable meals have been sitting around a campfire on safari, with interesting people telling stories late into the night. Emirates. An excellent network and superb service. Transformational experiences. When you travel with Abercrombie & Kent, you don't simply arrive at a destination and look at things; you learn from people with an intimate, lifelong knowledge of the region that help you get the most out of the experience, and you leave with a new understanding of how life is lived in another part of the world. Time. We always assume that money and goods represent luxury, but for most of us time has become far more valuable than money. The feeling that there is enough time, that there is no anxiety - that is true luxury. You can send back a pair of shoes but you can never replace a bad travel experience. Time is lost forever.